The annual Junior Breeder Livestock Symposium was held on March 30th. Between the fantastic turnout, interactive livestock sessions, and the best weather we’ve had in years, the symposium was a huge success. 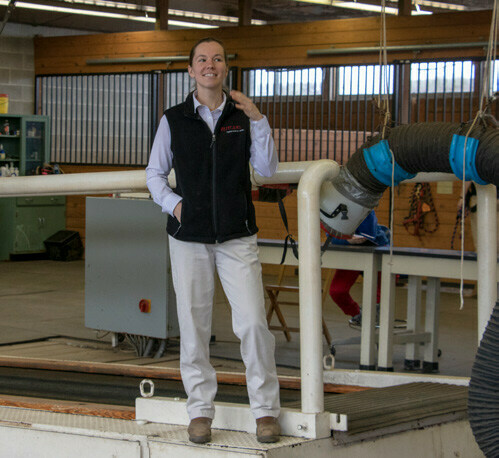 Dr. Anna Hausmann kicked off the first equine session, “First Aid on the Go,” covering all the essential tools that should be in any horseperson’s first aid kit. 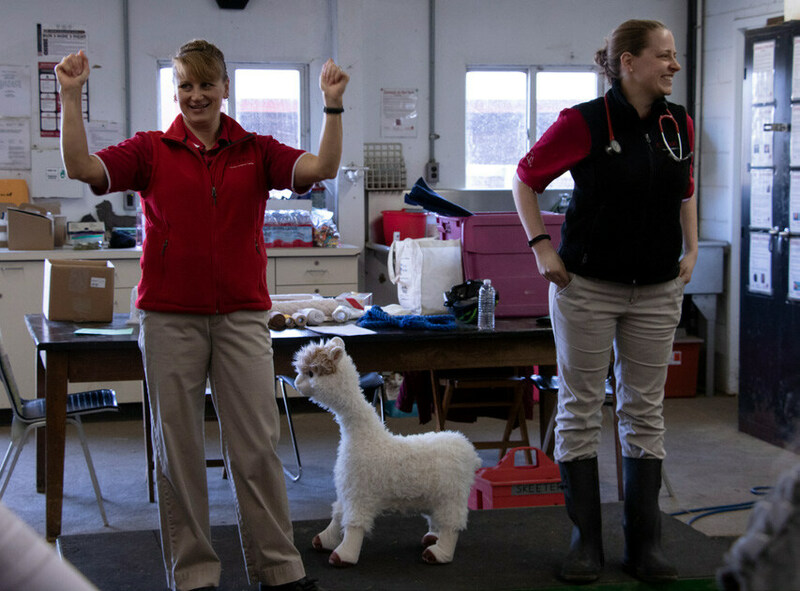 With the help of a stuffed “teaching llama,” Dr. Hausmann also showed the safest way to approach a downed horse and free a cast horse, and Rutgers University Teaching Herd (RUTH) member Gus was a perfect gentleman as Dr. Hausmann demonstrated the proper way to get control of a loose horse by using just a rope. The session concluded with hands-on leg wrapping for the participants. 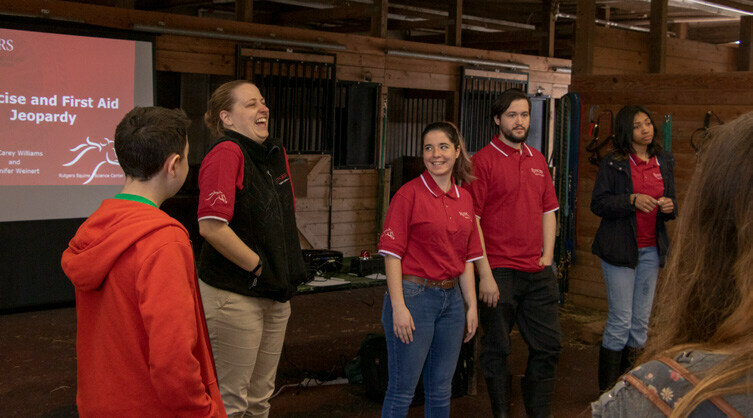 The second equine session, “Fit Horse, Fit Rider” was conducted by Dr. Sara Malone, who explained the importance of getting physically prepared for equine-related activities. She demonstrated both equine carrot stretches and human strengthening exercises. 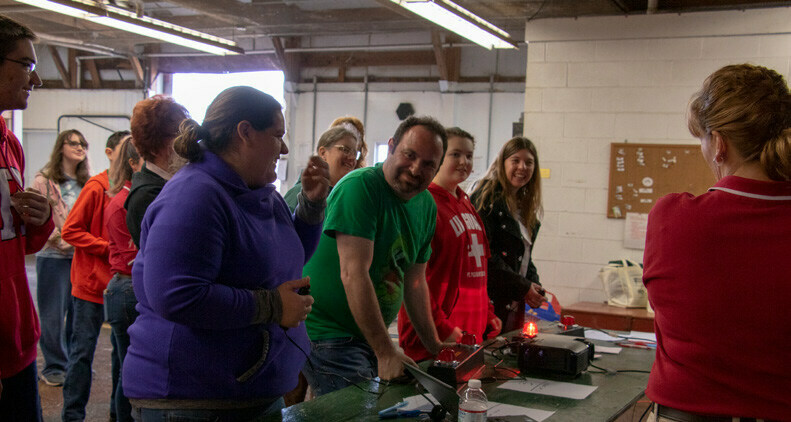 After the “lecture” component, participants got to see heart rate monitors in action with RUTH members Wiser and Marcie walking and trotting at different speeds on the Equicizer, and three participants keeping up with the horses on the outside, all wearing monitors! 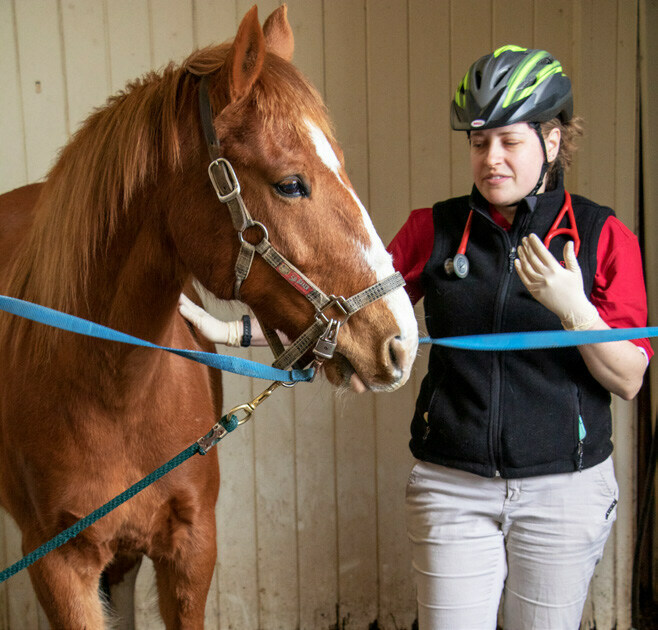 At the end of the session, the participants were able to practice taking heart rate measurements with stethoscopes on the RUTH horses. 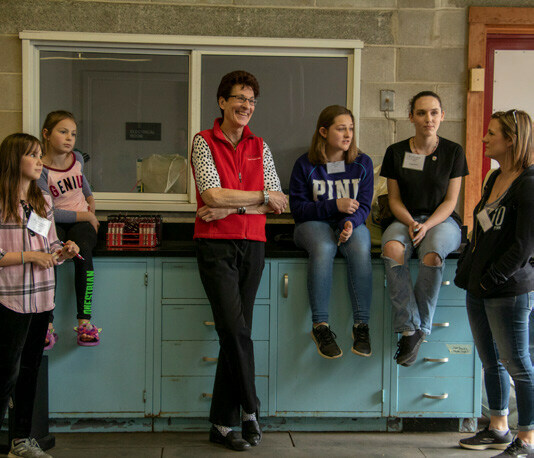 After lunch, Dr. Carey Williams and Ph.D. student Jennifer Weinert, hosted the longrunning Junior Breeder Jeopardy Game, which as always, was a big hit among both youth and adult participants alike. Participants got to show the knowledge and information they gained from the morning sessions. 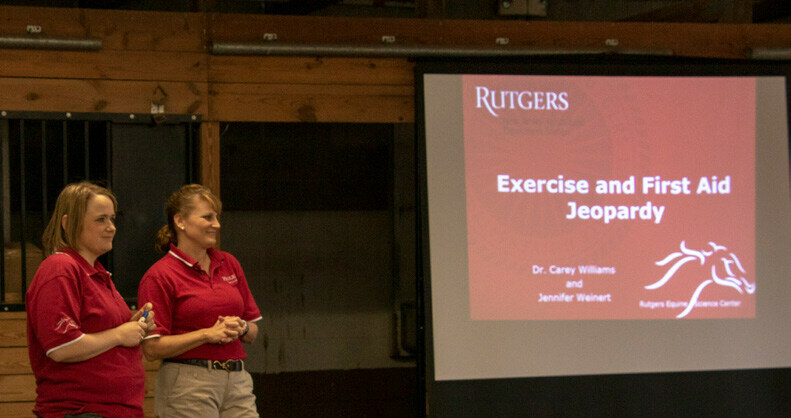 The final equine session of the day was the much-anticipated equine treadmill demonstration, hosted by Dr. Karyn Malinowski, who explained what the Equine Science Center is all about and highlighted current and past equine research and programs at Rutgers. Former racehorse (and current ESC research horse) Jolee put on a fantastic display of athleticism for the participants, showing off her walk, trot, canter, and pace on the equine treadmill. 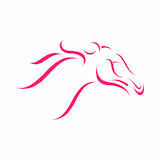 The fun wasn’t over after the final session; at the end of the day, Dr. Williams hosted the annual RUTH Meet-n-Greet, where the public got to learn about and meet the RUTH foster horses and their respective rescue organizations. 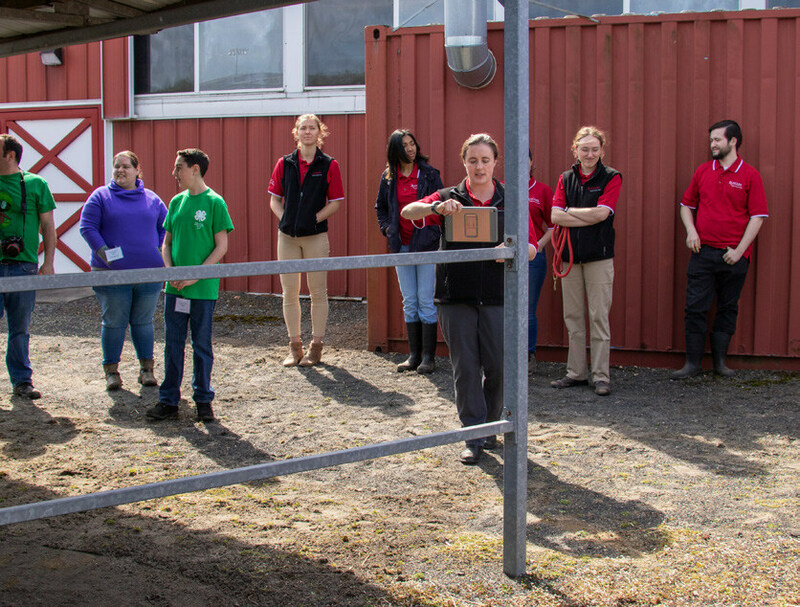 The horses and their student handlers got to show off the skills they have been practicing for Ag Field Day, and several of the foster horses piqued the interest of potential adopters.